As fall winds down, the best leaf blower can make much quicker work of those messy yards than a rake. But possible buyers should think about what kind of power and features they really need. For instance, a gas-powered blower will give you the most power, especially in larger yards–the trade-offs are dealing with a healthy amount of noise and maintaining a proper mixture of gas and oil to keep the engine working smoothly. For homeowners with smaller yards or fewer trees, an electric leaf blower might be more convenient. In general, these units are quieter and a better pick for anyone who might be bothered by fumes from a gas-powered engine. But most units are corded, which might make many electric blowers a no-go for those with large yards, and they aren’t as powerful. If you have trouble picking, these are our picks for six of the best leaf blowers. The WG520 has a top blower speed of 110 mph and moves up to 600 cubic feet of air per minute. 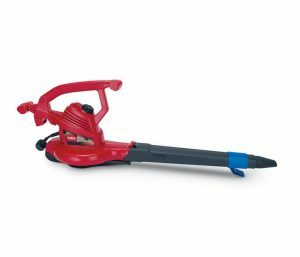 Reviewers praised its wide-mouth blowing tube which makes it better able to get to the bottom of thick and matted leaf piles than similar leaf blowers. They also praise the WG520 for being relatively lightweight at 6Â½ pounds, important for users who have larger yards or a lot of nooks and crannies to clean. Reviewers are also impressed with the easy-to-use, multispeed thumb-dial control, which can be reduced for more delicate cleanup work and turned up when maximum power is needed. Like most leaf blowers, the WG520 isn’t quiet, and expert testers give it lower marks for noise. Still, some users say it is less noisy than gas leaf blowers. It also demands users to buy an outdoor-rated extension cord if they don’t already have one. The blower comes with a three-year warranty. Buyers who want a gas-powered blower for a little extra oomph will want to check out the Hitachi RB24EAP, a longtime favorite of users who say it’s a wise choice for anyone with a leaf-filled yard. Experts rate it a bit higher than the WORX WG520, giving it top marks for sweeping, loosening debris, and ease of use. The Hitachi RB24EAP has a top blower speed of 170 mph and moves up to 441 cubic feet of air per minute. It has a 23.9 cc, low-emission engine that meets stricter California leaf-blower rules. Testers with Popular Mechanics praise its airstream and say it’s especially good for “moving soggy leaves and prickly seedpods.” Though not as lightweight as the WG520, it is still relatively light for a gas-powered leaf blower at just over 8Â½ pounds. Users say the two-finger throttle is easy to use, though some wish for a lock that would allow users to set it at a certain speed. Like most gas-powered leaf blowers, the Hitachi RB24EAP is loud, reviewers’ caution. 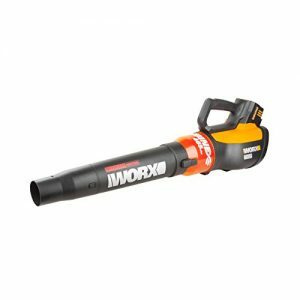 Experts give it only fair marks for noise at the ear, and most users say noise is in line with what they would expect from any gas leaf blower. If something goes wrong, note that this model comes with an impressively long seven-year warranty. 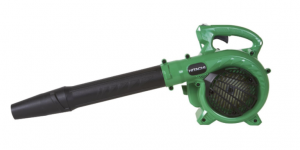 If your outdoor space is small and your budget is smaller, the corded electric Greenworks 24012 Single Speed Electric Blower offers a cheap, quick solution for anyone who wants to clear a small yard or hard surfaces such as patios, driveways, and sidewalks of leaves, dirt, grass clippings, and other debris. True to its name, the Greenworks 24012 offers just one speed, up to 160 mph, and moves up to 150 cubic feet of air per minute. It has a 7-amp motor that owners say is powerful enough for most light duty hard jobs, though some caution that it’s not ideal for bigger, more leaf-filled yards. Users love how lightweight it is, just 4Â½ pounds, and say its push-button start is very easy to use. 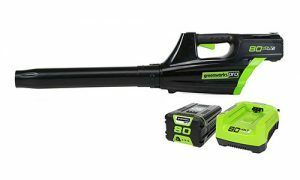 The Greenworks 24012 isn’t as noisy as gas-powered blowers, users say, and it has a four-year warranty–longer than many others. Of course, buyers will need to buy an outdoor-rated extension cord to use with it if they don’t already have one. Leaf blowers that function as vacuums and mulchers let homeowners do triple-duty when it comes to yard maintenance, and reviewers say the corded electric Toro 51619 Ultra Blower/Vac is one of the best. Experts give it top marks for sweeping, loosening and vacuuming debris, and very good ones for handling and ease of use. The Toro 51619 has a top speed of 250 mph and moves up to 410 cubic feet of air per minute. It comes with a vacuum bag and also has a durable metal motivateler that helps reduce up to 88 percent of mulched debris to sizes less than a half-inch. Most users say it does a great job at all of its functions and is easy to use. Experts say noise is about average with this leaf blower, fairly loud at the ear but much better at 50 feet. Buyers who don’t yet have an outdoor-rated extension cord will need to buy one for this unit. It comes with a two-year warranty. 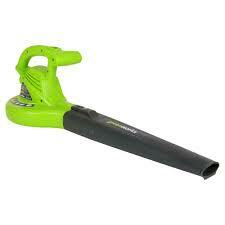 Some rechargeable leaf blowers are underpowered or have short-lived electrical storage devices. That’s not the case with the Greenworks Pro GBL80300 Cordless Blower, which reviewers say is almost as good at clearing a yard as a gas-powered blower. Experts give it very good marks for sweeping, handing, and ease of use, and top marks for loosening debris. The Greenworks Pro GBL80300 has a top speed of 125 mph and moves up to 500 cubic feet of air per minute. It weighs 8.2 pounds–about average for a blower–and runs on an 80-volt lithium ion electrical storage device that allows up to 70 minutes or runtime before needing to be charged, which only takes a half-hour. Reviewers love being able to go places without being connected by a power cord or dealing with the upkeep of a gas-powered machine. They also like having three speeds that help them adjust to light or heavy-duty work. A few report quality-control issues, however. If you’re noise-sensitive, note that the Greenworks Pro GBL80300 is one of the quieter leaf blowers you can buy. Experts give it good marks for noise at the ear, and users agree that it’s quiet enough not to bug the neighbors. It’s supported by a four-year warranty. For a leaf blower that’s small and low-priced yet still powerful, the BLACK+DECKER LB700 7-Amp Corded Blower is a great option. 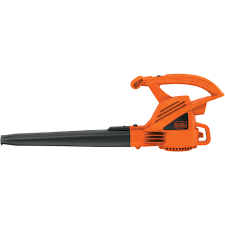 This product weighs less than 5 pounds, but it can blow leaves at up to 180 miles per hour for easy yard cleanup. This leaf blower from BLACK+DECKER has a 7-amp motor, and many reviewers say they were impressed at its power relative to its size. You’ll need an outdoor extension cord to operate the unit, and it has built-in cord keeping things from getting tangled while you work. Like many leaf blowers, this product is loud when in use, so if you’re sensitive to sound, you may want to use hearing protection when operating it. Overall, the BLACK+DECKER LB700 7-Amp Corded Blower is a highly low-priced yard cleanup solution that’s received lots of compliments from users. Considering its low price, it really is a great buy to help with your autumn yard work. 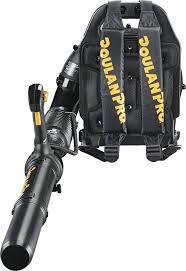 While on the more expensive end of the spectrum, the Poulan Pro 967087101 48cc Backpack Blower is a worthwhile investment for homeowners who have large yards to clean up. This backpack-style leaf blower is comfortable to wear, even for long periods of time, making it easier than ever to keep your yard spotless without getting tired out. 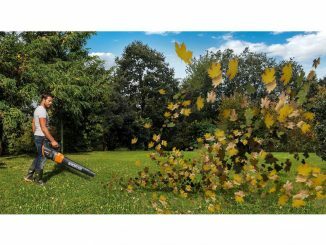 This gas-powered leaf blower features a powerful 2-stroke engine that can blow leafs and other yard debris at speeds up to 200 miles per hour. The unit weighs around 22 pounds, but users say it is comfortable to carry on your back, even for a few hours. The product features a cruise control option, as well as a changeable speed throttle control. It’s worth noting that some users have trouble starting the leaf blower, especially if they’re not familiar with gas-powered motors. However, most reviewers said they figured it out after a few tries and were OK from then on.